Death from below! 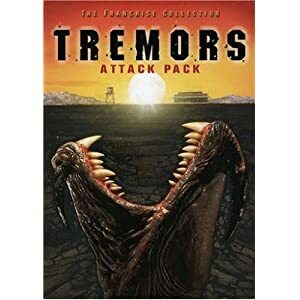 The Tremors Attack Pack contains 4 movies in 1 box, at a very low price. There are giant worm-like monsters living underground in the Nevada desert. They don't have legs or eyes but they can hunt down their prey with blinding speed and deadly precision. They adapt quickly to changing circumstances, and bring terror to their human prey in a whole new way each time. Each of the film contains new challenges for our small town heroes - Kevin Bacon and Fred Ward. The films are scary, funny, and full of suspense. Each movie is good, but to get all 4 for the price of 1 is too good to pass up!